Although you'll likely have to wait a little longer than usual for prime sweater weather and the leaves to change color this year, the official start of fall is just a few days away on September 22. As if to usher in the season, Starbucks is unleashing even more new fall-themed drinks as well as a special deal for 50% off espresso drinks on Thursday. On Thursday, September 20, Starbucks outposts all across the country are throwing a fall "Happy Hour" with a deal for half off on all espresso beverages, size grande or larger, from 3pm to close. The discount applies to the chain's lineup of fall drinks -- the Pumpkin Spice Latte, Salted Caramel Mocha, and newly reintroduced Maple Pecan Latte -- as well as classics like Mochas, Lattes, and Americanos, according to a spokesperson. Sure, the offer isn't a straight-up free drink giveaway, but hey, your afternoon pick-me-up may end up costing half what it usually does. Like with Starbucks' previous "Happy Hour" promotions, you have to be a member of the Starbucks Rewards program or sign up for the deals by RSVP'ing on the Starbucks Happy Hour site in order to get half-price drinks. Once that's all set, you'll get the offer in an email or via the Starbucks mobile app. Just keep in mind that some Starbucks locations may not be in on the happy hour deal and, uh, definitely don't show up at your local 'bucks demanding 50% before 3pm. That'd be awkward. 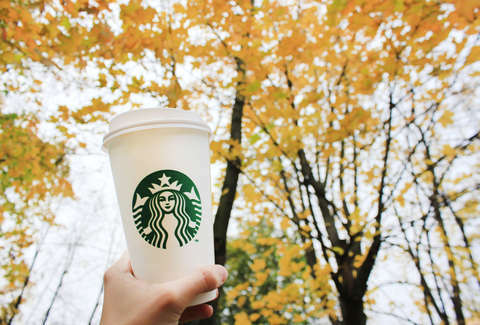 Starbucks announced the Maple Pecan Latte's return for a second year earlier this week, saying the drink complements the changing leaves of the season with sweet fall flavors. In case you don't remember, it's made with espresso, milk, maple syrup and pecan flavorings, and a "autumn sugar" topping. This year, however, it comes wit a bit of a twist: if you order one iced, you can get it finished with Starbucks' increasingly popular Cold Foam on top. Additionally, the coffee chain announced the launch of an all-new drink called Cold Foam Dark Cocoa Nitro, which it describes as "inspired by a dark chocolate stout" and "velvety-smooth" with bittersweet cocoa flavors. Whether cheap coffee drinks will somehow make it feel like fall is arriving sooner is unclear, though it may just boil down to your mindset. In any case, cheap caffeine is cheap caffeine.